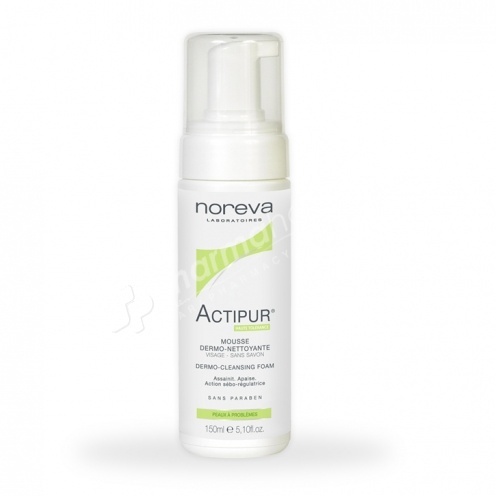 Noreva Actipur Dermo-Cleansing Foam cleanses oily skin with imperfections. Noreva Actipur Dermo-Cleansing Foam 150ml provides effective cleansing of oily skin with imperfections, eliminating all impurities and regulating the flow of sebum. It also helps to limit bacterial growth and contains a hemostatic agent. The skin is purified, clean and soothed. Apply on the face, massage, rinse. Aqua, Cocamidopropyl Betaine, Sodium Lauroyl Sarcosinate, Sodium Laureth Sulfate, Glycerin, Populus Tremuloides Bark Extract, Zinc Gluconate, Tetrasodium Glutamate Diacetate, Sodium Hydroxide, Phenoxyethanol, Sodium Benzoate, Citric Acid.